Here you are with your partner, wanting to talk about ways to deal with the kids–actually, his kids. You’re not happy about the way he’s treating you or them. There is little accountability for whatever they do or say, they seem to be running the home, and you have little to no space to say or do anything. You feel trapped in a home that is not yours. You see things happening that you know, if it were “your” kids, you’d never allow to happen. How can you approach your husband/partner with this? What can you do? 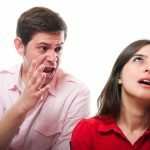 A conversation gone wrong can have unfortunate consequences–taking a toll on intimacy and trust and allowing resentment and misunderstanding to flourish–but it’s possible to handle difficult conversations with skill. Here are ten ways to begin conversations that will rebuild and replenish your relationship. First ask yourself what is the problem and why it is bothering you. Become aware of what the real issue is before starting to blame the other person. Set an agenda and a specific time frame. Talk about one issue at a time. This is especially true for women who feel that this might be the only time to spill it all out. For men, in general, they only want to handle one problem at a time. Ask if this is a good time to talk; don’t assume that you can discuss the issue when it happens. Scheduling a set number of minutes (not hours) will greatly improve the chances of being heard and coming to a solution. Be clear and specific about what it is that’s bothering you. If you approach your partner and say, “I don’t like how you’re raising the kids,” that won’t cut it. It’s too vague and it may imply that you don’t like ANYTHING this person is doing. If it’s the fact that your partner doesn’t enforce the house rule of putting the dishes in the sink after eating, say it then ask your partner for a better way of dealing with this. Seek first to understand then be understood. Stephen Cover mentions this is his book 7 Habits of Highly Effective People. Covey writes that we all see the world according to our own pair of glasses. Sometimes they are crystal clear, other times they are full of smudges. Try to see through the other person’s glasses and see where you are both coming from. Give lots of praise for what is being done well. This is a time when tension rises and defense mechanisms surface. When that happens, the other person stops listening. People need to know they are valued and appreciated. Use the “sandwich approach.” Start with a compliment, add an action step for what you’d like to see change, and end with another compliment. Be willing to apologize for your contribution to the problem. Problems never occur in isolation. There are always two in the conflict; otherwise, there would be no conflict. Again, go back to the beginning where you reflected on what was really the issue and look at your contribution to the difficulty. Acknowledge it to your partner and offer to do something different next time. Come up with a solution that both of you agree on. Create a plan of implementation. Again, be very specific and clear on who will do what to accomplish your mutually agreed-upon goal. This is not a time for assuming, implying, or guessing. Write it down if you must. Memory has a funny way of remembering only what makes sense to us at the moment. Agree to check up later that week to see if you are both still OK with the plan that you both agreed upon. Sometimes we think that because we talked about an issue, it is resolved and we don’t need to think about it again (I know some men who think like that). Doing a checkup on the way things are going assures that the conflict is actually being dealt with in a constructive way, instead of it being swept under a rug, only to resurface as a bigger problem in the future. Always end with appreciation and gratitude for your partner taking the time to discuss this issue with you. It is especially important for women to TELL husbands this because hinting and implying doesn’t work very well. When coming together in a stepfamily, it’s really important to acknowledge your partner for all the things that are done right or he/she will think of themselves as failures and won’t want to continue to work with you. Follow these ten steps and they will greatly improve on how you and your spouse deal with issues, whether they are related to your step family or concern other areas of your life together. 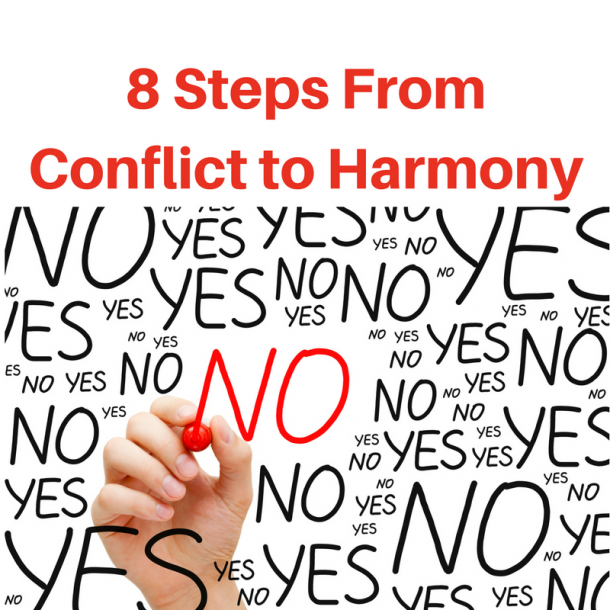 Want to receive The 8 Steps From Conflict to Harmony? Just Fill in the form below and you can download it now. Get My FREE Ebook Here! YEA! Your FREE Ebook is Coming! 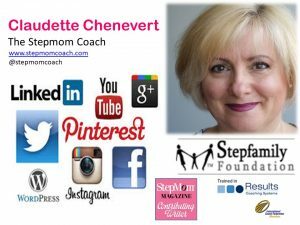 Check your in-box for an email from me - Claudette Chenevert - The Stepmom Coach. 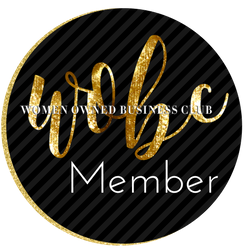 Claudette became a Master Certified Stepfamily Foundation Coach when she realized that too many women weren’t getting enough help and support. In 1990, Claudette became a stepmom to two stepdaughters. She is also a mother to a grown son and grandmother of seven. Any thoughts and comments you’d like to share? Post your comment below and we’ll get back to you very soon.